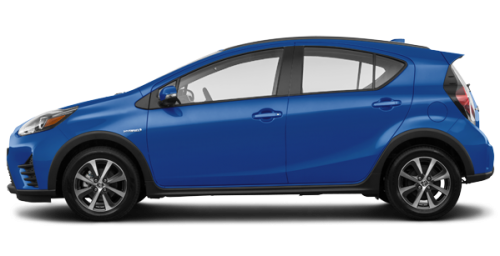 Lease the 2019 Toyota Prius C starting from $76 weekly at 3.99% for up to 60 months with $0 down! Certain conditions apply. This offer is valid until April 30th, 2019. Retail lease and purchase financing offered through Toyota Canada Inc. upon credit approval from Toyota Financial Services. All the following fees are extra: registration, insurance, taxes, RDPRM registration and agent registration fees (where applicable). 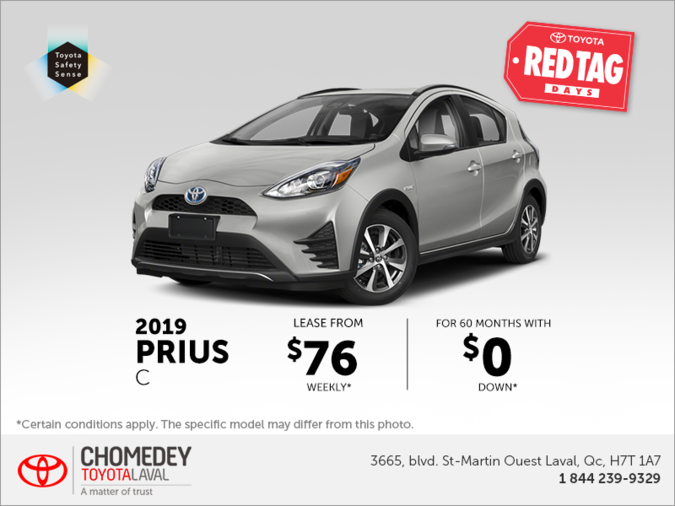 Subject to applicable conditions, offers are for individuals who lease or buy a vehicle until May 1st, 2019, at a participating dealer in Quebec, where you can find full details. All prices reflect the manufacturer’s suggested retail price (MSRP) in Canadian dollars after deduction of advertised incentives, plus freight and preparation fees, and if applicable, dealers fees up to $399 and air conditioning charge. The dealer may sell or lease at a lower price. Toyota dealers are free to set their own sale or lease prices for Toyota products and services. Taxes, fees, insurance, and registration, as well as any other additionalproduct or service that may be available through your selected Toyota dealer, are NOT included.